A fully qualified PADI Instructor for a number of years, "Little" Matt is our top man at the resort. Not only guiding students through their first steps into scuba diving, Matt is also responsible for our team of Divemasters and the education of future PADI professional divers. Alex is in control of all fun dive tours including speed boat trips to Sail Rock. Also in charge of maintaining our equipment, Alex is our specialist expert in this field! Omar is a Director of Deep Down Productions, our very own photography & videography company! A respected filmaker, Omar's professional level training will opens up a whole new world for divers! English, German, French, Dutch, Spanish, Portugese, Italian, Swedish, Finnish, Danish, Norweigen, Hebrew, Thai, Japanese. 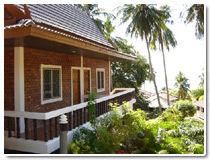 Based in two stunning locations, Chalok Ban Khao Bay and Mae Haad Beach, our resort offers bungalows with discounts for all of our divers. 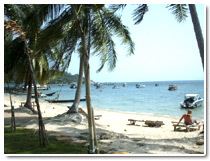 Koh Tao has developed in recent years into a truly tropical escape, one of Thailand's island gems blessed with golden bays and beaches. "Turtle Island" is a paradise both above AND below the water!